Either way, I received a sample of the Burger Pocket Press to try out and decided to challenge it against my normal hand made process. Excuse the weird audio at the end. I was using a computer with an underpowered processor, I wasn't turning into Charlie Brown's teacher. Waa wah wah waaa. 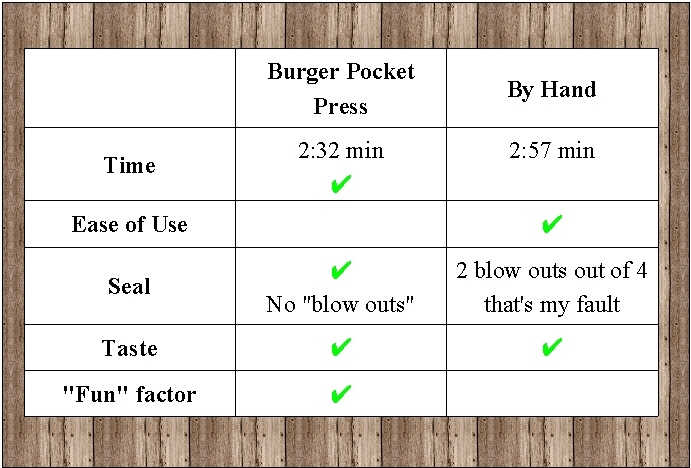 So how did the Burger Pocket Press do against my two hands? I was honestly surprised. Going into this my assumption was that this would do a decent job but nothing I couldn't already do by hand. I guess the biggest "wow" was the time difference. As I was making them, it seemed like the Burger Pocket Press took much longer to make each burger than doing them by hand. But after timing it on video, it turned out I was wrong. Doing them by hand is still easier in my opinion, but that's just what I'm used to. Old dog, new trick. Hand made burger on left, Burger Pocket Press on right. I was worried the Burger Pocket Press might not seal the burger as well. 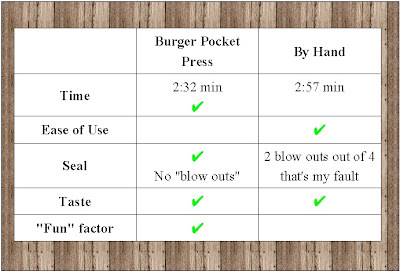 That's why I focused on the "push and twist" technique and it worked because none of the 4 pressed burgers ruptured. If you just press straight down like their video shows, I doubt you'd get the same seal. 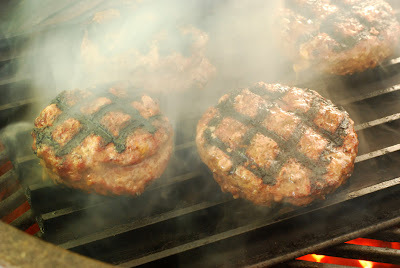 Then again, I was sloppy with my hand made patties, normally most of mine hold up. There was no taste difference between the burgers. I didn't plan on rating this category, it happened spontaneously. No one in the house has EVER offered to help me with making burgers. But as I was doing these, everyone was curious and my wife and 11 y/o son both got involved, having fun making their own burgers. Even after dinner, both of them kept offering ideas for the ultimate stuffed burger recipe. Some of the other selling points about this tool is that it is dishwasher safe, made in the USA, and can also be used to make regular hamburger patties. The only downside is that I think the price point might be a deterrent for impulse buys. 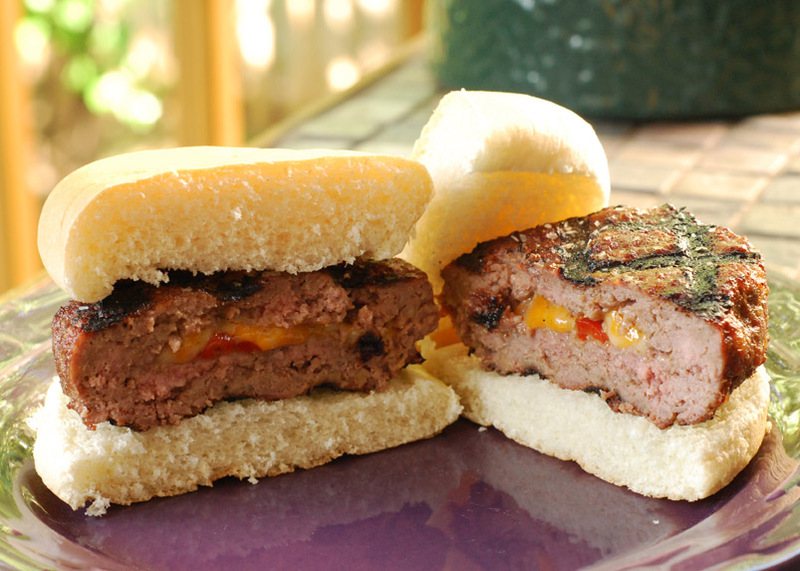 In summary, whether made by hand or Burger Pocket Press stuffed burgers are juicylicious, fun, and get attention from the crowd. If you really want to impress your family and friends at cook outs this summer, don't just grill burgers.....tell 'em to STUFF IT! [Standard Disclaimer] I received the Burger Pocket Press as a free sample from the manufacturer.